2 Strathview is a stylish apartment that offers comfortable accommodation and everything you could need for a relaxing getaway. 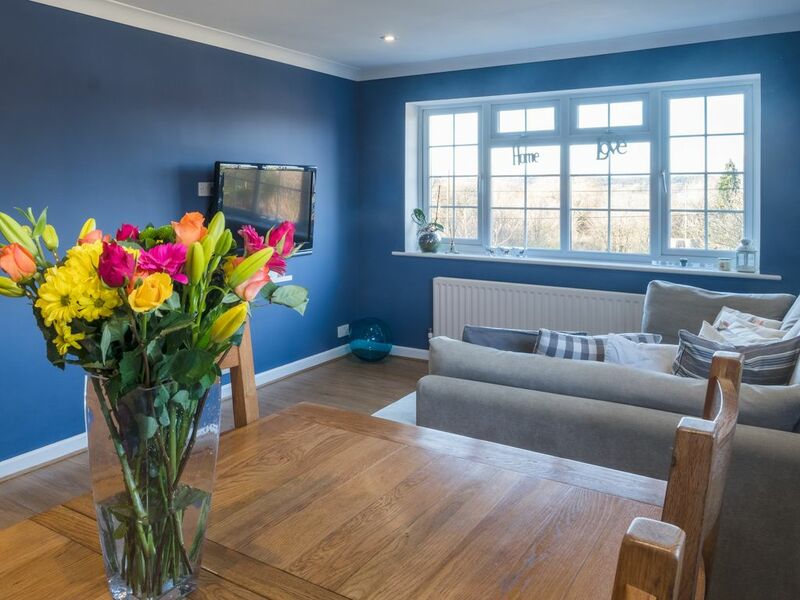 Beautifully equipped 2 double bedroom flat it's a perfect base for a weekend of shopping, eating out, exploring the New Forest and the local beaches. Located on the outskirts of Ringwood, close to cycle routes, Bournemouth and Salisbury, and a host of nearby attractions. 2 Strathview is a first floor maisonette, tucked away at the bottom of a private driveway. There is communal entrance shared with only 1 neighbour. A flight of stairs takes you to private yellow front door. As you enter the flat to your left there is living / dining room, which has a super comfortable corner sofa with plenty of cushions. There is a flat screen TV and Blu-Ray player with plenty of Blu-Ray movies to watch and excellent WiFi, which you are welcome to use. There is also a dining table with space for 4, perfect for enjoying a home cooked brunch or dinner. Opposite the lounge is the kitchen, which has everything you'll need to cook: 4-ring hob, oven, integrated dishwasher, integrated fridge / freezer, integrated washing machine plus toaster and kettle. There’s also plenty of crockery, cutlery, glasses, saucepans and cooking utensils. Tea, coffee & milk are provided. To the right from the front door there are 2 double bedrooms, which have king size beds with fresh bed linen and towels. There is also storage and hanging space for your belongings. Next to the bedrooms is the bathroom, which comes with corner shower cubicle, wash hand basin with storage below as well as a heated towel rail and WC. We also provide shampoo and soap, in case you forget to pack it in your suitcase. There is a private garden with raised decking area. It’s the perfect break all year around; fantastic sunny days in the Summer and fabulous blustery days in the Winter - all with amazing views and great opportunities for healthy exploration. Hi, I'm Sam Garbett and I manage the 2 Strathview Holiday apartment. I will do my up most to make sure you have a fantastic stay with us here in the New Forest. Excellent WiFi, which you are welcome to use. A super comfortable corner sofa with plenty of cushions. Tea, coffee & milk are provided. There’s also plenty of crockery, cutlery, glasses, saucepans and cooking utensils. 4-ring hob, oven, integrated dishwasher, integrated fridge / freezer, integrated washing machine plus toaster and kettle. There is a dining table with space for 4, perfect for enjoying a home cooked brunch or dinner. There is a flat screen TV and Blu-Ray player with plenty of Blu-Ray movies to watch. Very comfortable&clean. The owner was always quick to reply and help. We enjoyed recommended walks. Please note that this is on the first floor. But there is a garden belongs to this which was very convenient to let my dog out in the evening. Ideal apartment for a family break! Staying in ringwood was an excellent location for access to the New Forest and coast. We ventured to Lulworth Cove, Durdle Door, Lymington, Bolderwood and Moors Valley Country Park - we highly recommend them all! Communication during booking this accommodation was efficient and friendly. Thank you Sam, we will definitely recommend you to friends and family! Well equipped, clean property in a great location. Well maintained and comfortable flat with everything needed. Ringwood proved to be a good centre to stay being within easy reach of both the New Forest and the south coast. The flat was bright, clean and in good order with everything that we needed for our stay. The beds were very comfortable which is something that you don't always get in holiday rentals. The owners were most helpful when we needed information and prompt to respond. I would highly recommend staying here. The flat is even nicer than the photo's with very comfy beds, towels and linen. Fresh, bright, airy and immaculately clean. The property was exactly as described, comfy and well equipped. Located just outside the town, there was easy access to the beautiful New Forest and many nearby attractions. All dealings with Sam have been friendly, speedy and efficient. Ringwood sits between two forests: Ringwood Forest with its wealth of pine trees and cycle paths includes Moors Valley Country Park, and the New Forest National Park, which offers thousands of acres of moor, heath and woodlands where ponies, donkeys and cattle roam free. You may also see wild deer, foxes, badger, rabbits and a wide variety of birds. Both forests are fantastic for exploring whether on foot, bike or horse. Ringwood offers: - A comprehensive range of shops both independently owned and national chains such as Phase Eight, Jaeger, Fat Face, Clarkes, W.H. Smith, Paperchase etc. - A wealth of cafeterias and restaurants including Italian, Thai, Tapas and Indian; mainly independents but with a few chains such as Caffè Nero, Subway and Prezzo. - Local pubs within walking distance and they offer a range of local ales. - Three supermarkets: Waitrose, Sainsbury's and Iceland - Coarse fishing on the River Avon; day tickets can be purchased from the tackle shops in West Street. - Mountain bike off road trails in both forests and BMX obstacle course at Moors Valley. - Spinnaker Sailing Club and New Forest Water Park within a few minutes' drive. - Riding schools nearby offering hacks across the New Forest for both the beginner and the more experienced rider. - 12 miles from Bournemouth and its award winning beaches and lively nightlife. - 15 miles from Salisbury where you will find Stonehenge and the tallest Cathedral Spire in England. - Half a dozen golf courses within a 10/15 minute drive. - Two theme parks within 15 minutes drive: Paulton's Park and Adventure Wonderland. - 30 mins drive from Poole and Sandbanks.